If you think "American Idol" hopefuls, Adam Lambert and Kris Allen, look good in glam rock "guyliner" or a basic white T-shirt and jeans, wait until you see one of them in Mickey Mouse ears. After the "American Idol" winner is crowned during tonight's "American Idol" finale, held at the Nokia Theatre in Los Angeles, Calif., his first words will be "I'm Going to Disney World!" This will then become an ad campaign. 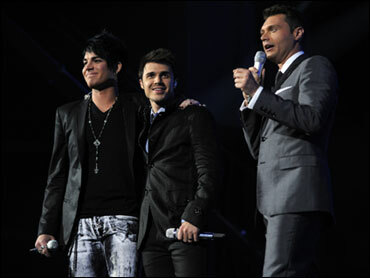 "Idol" host Ryan Seacrest is expected to say, "You've just been named the new 'American Idol.' What Are You Going To Do Next?" and the winner will give the famous response. The winner's voice will also be featured throughout the ad as he performs the song, "When You Wish Upon A Star." The famous lines, typically said by victorious sports stars - including Super Bowl heroes and World Series champs - will make Lambert or Allen the second singer to ever star in the Disney commercial in its 20-plus year history. Last year's "American Idol" champion, David Cook, was the first. The Disney ad also marks the newly opened "American Idol Experience" attraction at Walt Disney World Resort in Florida.